Feature-Packed Accounting Software Designed for Schools! POINT OF SALES/INVOICING No need to work about which books and supplies are used in a class, Bottom Line handles this tedious task for you. BOOK & SUPPLY INVENTORY A single financial aid disbursement can easily be posted to multiple student accounts! PURCHASE ORDER Automatically reduces inventory for each student purchase and increases inventory with each PO accepted! ACCOUNTS PAYABLE Compares upcoming needs based on projected enrollment with the inventory-on-hand to produce accurate projections of needed inventory. PAYROLL This payroll module gives you complete and accurate payroll-related information on all your employees. GENERAL LEDGER A vital business tool, the General Ledger module can generate a complete range of financial reports including financial statements. BANK RECONCILIATION This time-saving module requires no additional input! It balances your checkbook, monitors the balance of your credit card. s and loan statements and quickly discovers the exact amount of any discrepancies. 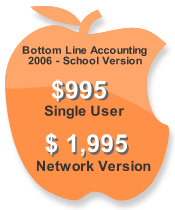 Copyright © 2011 Bottom Line Accounting Software, Inc. All rights reserved.